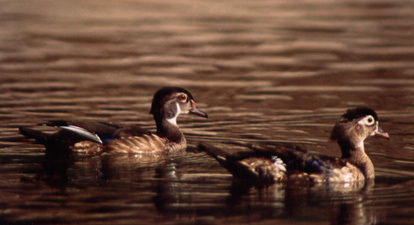 Mom and Pop ducks together have always fascinated me. Individual ducks are among the easiest birds to photograph, but getting male and female in the same frame is a challenge, and it's fun to see plumage differences side by side. We've heard from two well-respected birders who took offense at comments made in the introduction of this column back in November-December 1997. These experts reacted negatively to the statement that "it has long been my contention that Birding 's photo quizzes use bad photos of easy birds rather than good photos of difficult birds....."
We regret that these comments were interpreted as being critical of Birding 's photo editor and contributors; this was certainly not the intent. We understand that the selection of the photos used in Birding was made for their educational value, not necessarily for their artistic skill. The comments were made from a photographer's perspective. A good photographer will judge any photograph as poor that does not show a bird to best advantage; a photo that does not show the head or otherwise obscures a major field mark is classified as a poor photo. But for purposes of forcing the viewer to look at field marks that otherwise might be missed, such photos have high educational value, and thus are good in another interpretation. We offer public apology to anyone who missed the intent of the original statement.